A new expansion for the Pokemon TCG, Sun & Moon�Ultra Prism, will be released on February 2, 2018. 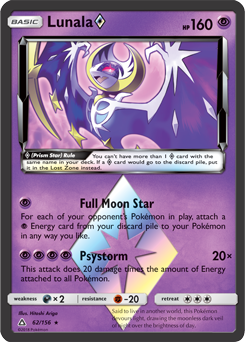 The latest expansion introduces Prism Star cards, a powerful new type of Pokemon and Trainer card. To balance their power, only one of each Prism Star card is allowed in a player's deck, compared to the usual limit of four. These cards are also discarded into the Lost Zone, rather than the discard pile. The new set, which features over 150 cards, includes six Prism Star cards in total, as well as five Ultra Beasts and 18 full-art cards. The expansion is "set in an alternate version of Sinnoh, one of the twisted parallel regions that players can reach by traveling through an Ultra Wormhole."